Claudine Land holds a PhD in molecular and cellular biology, specializing in tropical medicine, parasite genetics and retrotransposons/retroviruses, with postdoctoral research experience in molecular entomology and computational genomics. A biomedical writer since 2008, she has interviewed countless medical experts in a broad range of subjects, from addiction treatment to pediatric injuries to mind-body medicine for wellness. 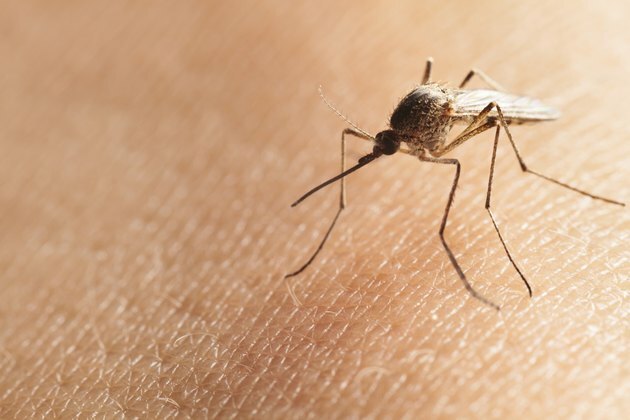 Through their transmission of diseases like malaria, yellow fever and West Nile virus, mosquitoes have been responsible for more deaths than any other animal in history. While many mosquito-transmitted diseases are considered historical, or diseases only relevant outside the United States, West Nile virus cases have been seen in nearly every U.S. state. Even uninfected mosquitoes are reviled as they irritate people with their itchy bites. So it's understandable when people reach for easy ways to repel these blood-sucking insects. Vitamin B1, also known as thiamine, is one such easy solution. Unfortunately, there's no evidence that it works. The authors of a June 2005 review article published in the "Journal of the American Mosquito Control Association" reported that of the scientific studies performed testing B vitamins as repellents, none found them to have significant repellent ability against mosquitoes. In addition, the American Mosquito Control Association asserts that systemic vitamin repellents, in general, do not work. Vitamin B1 delivered as a skin patch has also been tested and did not repel mosquitoes, according an February 2013 study report published in "Acta Tropica." While vitamin B1 is not effective as a mosquito repellent, there are plenty of alternatives. Many natural, plant-based repellents -- such as lemon eucalyptus leaf extracts and citronella -- are quite effective at repelling mosquitoes, report the authors of a March 2011 "Malaria Journal" review article. While some people prefer natural repellents, several safe and effective synthetic repellents are available, including those containing DEET or icaridin. Can Vitamins Prevent Mosquito Bites? Are Vitamins Organic or Inorganic? Are There Vitamins That Can Raise Platelets?